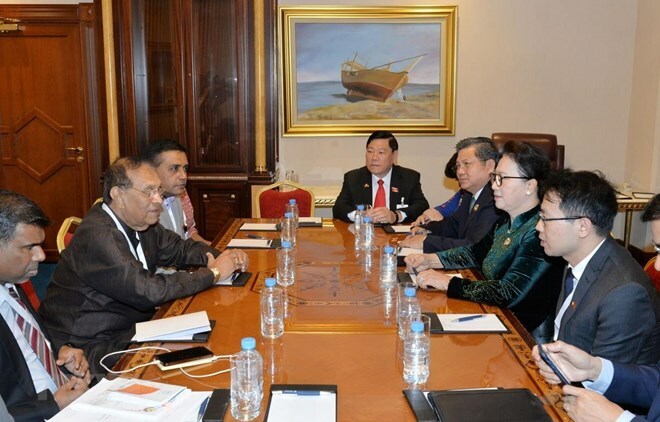 Doha (VNA) – Chairwoman of the National Assembly Nguyen Thi Kim Ngan had a meeting with Speaker of the Parliament of Sri Lanka Karu Jayasuriya on April 7 on the sidelines of the 140th Assembly of the Inter-Parliamentary Union (IPU-140) in Doha, Qatar. The two legislative leaders laid stress on the traditional friendship between the two nations, and shared the view that the ties should be further strengthened and developed based on each other’s potential and strengths. Karu Jayasuriya said that Sri Lankan leaders have had discussions with the Vietnamese Ambassador to Sri Lanka and the Sri Lankan Ambassador to Vietnam to arrange delegation exchanges in the time ahead as well as seek measures to boost cooperative relations, especially in promoting Vietnamese exports to the southern Asian country and wind power collaboration. He took the occasion to invite NA Chairwoman Ngan to pay an official visit to Sri Lanka at a suitable time. The Vietnamese top legislator recalled her good impression on Sri Lankan people and country during her visit to Sri Lanka in February 2013 when she was serving as a NA Vice Chairwoman, and accepted the invitation to visit the country with pleasure. Vietnam and Sri Lanka set up diplomatic relations on July 21, 1970. The sound friendship and cooperation have been nurtured and consolidated by the two countries in the past time.